Protected bike lanes are now officially star-spangled. 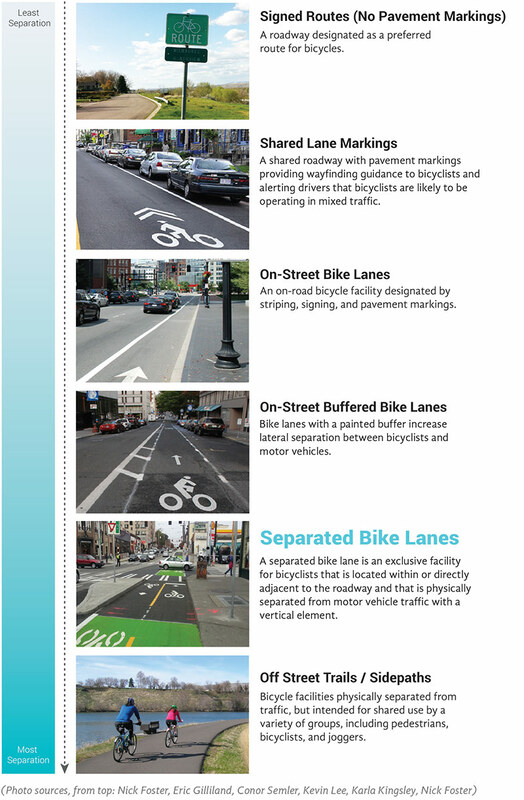 Eight years after New York City created a Netherlands-inspired bikeway on 9th Avenue by putting it on the curb side of a car parking lane, the physically separated designs once perceived as outlandish haven’t just become increasingly common from coast to coast—they’ve been detailed in a new design guide by the Federal Highway Administration (FHWA). The FHWA guidance released Tuesday is the result of two years of research into numerous modern protected bike lanes around the country, in consultation with a team of national experts. The guidance comes two years after the FHWA used a public memo to endorse the somewhat similar third-party design guides from NACTO and the Institute of Transportation Engineers. It’s also a few months after a different sort of milestone: as of last November, protected bike lanes are on the ground in more than half of U.S. states. Amid so much enthusiasm for the new designs, the federal government’s decision to create a national guide makes sense, said Betsy Jacobsen, bicycle and pedestrian section manager for the Colorado Department of Transportation. The biggest winners on Tuesday, Jacobsen said, will be cities, states and other agencies that don’t yet have in-house expertise in the many nuances of protected bike design.